A story that unfolds over a quarter of a century and hinges on a single moment: when David lies to his wife, Norah, about the birth of her daughter. Edwards' novel alternates perspectives between Caroline and Phoebe's lives and those of members of the Henry family. Norah is devastated by the news of her second child's death; she turns to alcohol and other men to fill the void … Photography is the major motif throughout the novel, which is named for the first camera Norah gives her husband in the early days of their marriage, The Memory Keeper … Edwards...is a born novelist. From the riveting depiction of the twins' birth, which opens the book, she sustains suspense through 400 pages of compelling prose, consistent characterization and a plot that is poignant without being preachy or sticky-sweet. Edwards specialises in a tasteful brand of commercial writing that starts with a humdinger of a premise: in this case a young doctor's decision to spare his wife by spiriting away a disabled twin shortly after birth. A predicament so deliciously high on schadenfreude injects family drama with a touch of the misery memoir … This is an unlikely scenario, burdened with too many improbables and underpinned by a structure of convenient psychological justifications. But there's no denying Edwards's ability to spin a tale, and The Memory Keeper's Daughter is gripping from its start … With such a long progression of parallel lives, we need the pay-off to be dramatic, but the expected explosion turns out to be more of a happy fizzle. This is a highly accomplished, well-written novel that lacks soul. It's a page-turner on Valium. The book is a compelling story that explores universal themes: the secrets we harbor, even from those we love; our ability to rationalize all manner of lies; and our fear that there will always be something unknowable about the people we love most … The book follows the lives of these families in parallel as they unfold on the paths that Henry's lie has propelled them. Grief, guilt and deceit build an impenetrable wall between Henry and Norah, and eventually, Paul, their son; and the happiness that Caroline finds for herself and her daughter is shadowed by her complicity in Henry's transgression … Edwards' novel is as much a page-turner as any airport novel, but her prose takes on the cadence of poetry as she vividly describes the landscapes her characters inhabit and the burdens they carry. 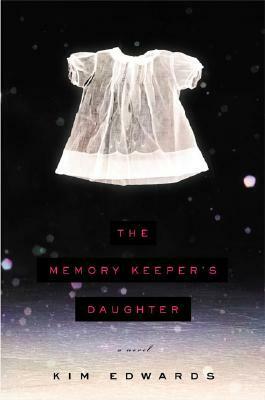 What did you think of The Memory Keeper's Daughter?